SPINACH, and Spinach Salade Lyonnaise! A big thank you to The Land Connection who is able to supply all of this material to us! And a big thanks to the Illinois Department of Agriculture specialty crop grant that makes this healthy, happy and yummy information possible. If you wish to become part of the cause, or get the newsletter in your inbox, visit www.thelandconnection.org/sveggies. Please tell other farmers, local food fans, bloggers, and others that they too can sign up for these free weekly vegetable profiles at this link! For many baby-boomers, the constant refrain of "Eat your spinach, it's good for you!" and the olive green glop of canned vegetable that accompanied the words, led to life-long spinach avoidance. Well now is the time, if you haven't already, to overcome your spinach phobia. One nibble of a local farmer's sweet and vibrant fresh spinach will do the trick. The first spinach you see every spring is most likely from seeds that your farmer planted late last fall. Those seeds germinate and barely start to put down roots before the frigid weather descends and they go into dormancy under the ice and snow. At the first hint of spring, however, they start growing like mad, and soon the leaves are huge, thick, juicy and sweet--unbelievably rich and meaty. You really have to taste it to believe it. If great taste alone is not enough, remember that spinach is high in vitamins A and C, and in iron and folic acid. It's also a good source of fiber and magnesium, and is very low in calories. And if you're still not convinced, wine fortified with spinach juice was the healing elixir traditionally given to injured French soldiers. And the Persians, who cultivated the leafy green from at least the 6th century, recognized spinach's sophistication and called it "the prince of vegetables." The best thing to do with any fresh vegetable is almost nothing. But I confess that I have become dangerously enamored of this Fresh Spinach Salade Lyonnaise. It is quick and easy to make, yet fit for a king with the combination of meaty-leaved spinach, crisp bacon, barely cooked eggs, and warm, sharp Dijon vinaigrette. (If you want to go vegetarian or vegan, just leave out the bacon and egg, adding another few tablespoons of olive oil to the dressing.) Keep this salad in mind when fall greens like frisee, escarole, and radicchio roll around because the hot dressing will soften and sweeten those sturdy leaves. 1. Put greens in a large salad bowl. Put olive oil in a skillet over medium heat. When hot, add the bacon and cook slowly until crisp all over, about 10 minutes. Add vinegar and mustard to the skillet and bring just to a boil, stirring, then turn off heat. 2. Meanwhile, bring a couple inches of salted water to a boil in a small pan, then lower heat to barely bubbling. One at a time, break eggs into a shallow bowl and slip them into the bubbling water. Poach the eggs for 2 minutes, until the white is set but the yolk is still runny. 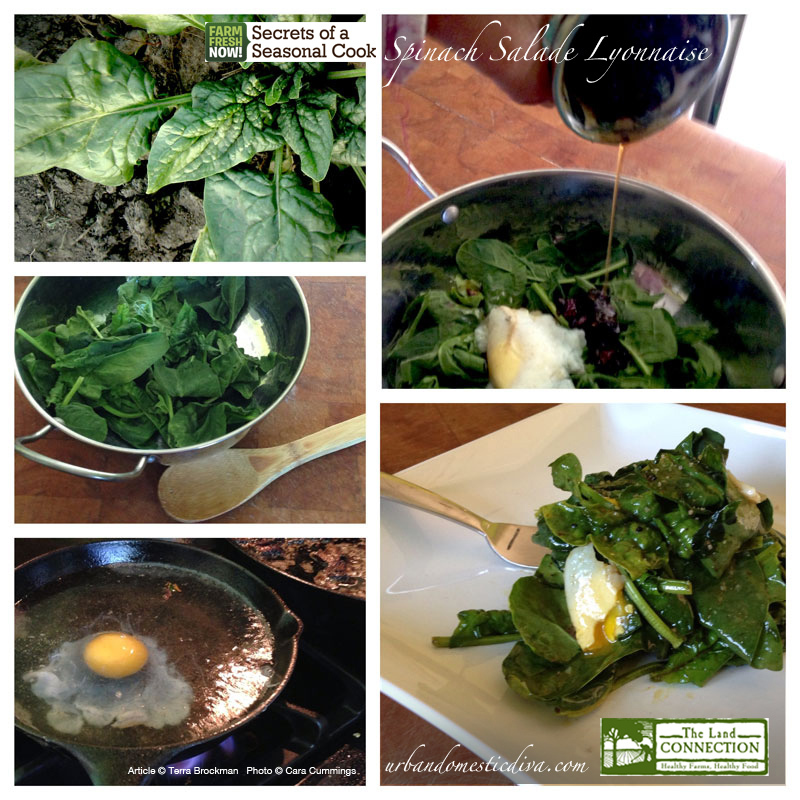 Remove each egg with a slotted spoon, and place onto the greens. 3. Pour the bacon dressing over the greens (they'll wilt a bit). Toss the salad, breaking the yolks of the poached eggs and distributing them evenly over the spinach. Season with salt and pepper to taste. Serve immediately, with croutons or toast if you like. The best way to enjoy healthy, seasonal produce is to buy it from your local farmer. To locate the nearest farmers' market or farm CSA near you, search for "Local Harvest" online. Farm Fresh Now! is a project of The Land Connection, an educational nonprofit that preserves farmland, trains farmers in resilient and restorative farming techniques, and connects people with great locally-grown foods. This series is made possible with generous support from the Illinois Department of Agriculture.